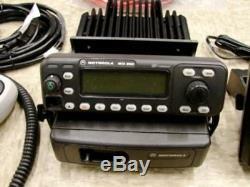 Motorola MCS2000 UHF Model 2 100 Watts 403-470 HAM. Motorola MCS2000 UHF Remote Mount Model II - model number M01RLM9PW6BN. 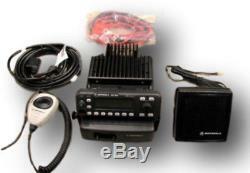 This is a 100 watt, 160 channel radio with a band split of 403-470 Mhz Unit comes complete with palm mic, external speaker, control head, control cable, mounting tray and power cable. Radio is in excellent shape and guaranteed not DOA. System Compatibilities - Compatible with conventional, simulcast, AMSS, StartSite, SMARTNET, SMARTNET Type I SECURENET, StatAlert, and SmartZone. Narrow Band Operation - Software configurable bandwith operation for VHF and UHF can be programmed to operate at 12.5, 25, or 30 kHz channel bands. Broad Band Operation - Offers unprecedented band extensions in VHF and UHF-one radio covers multiple sub-bands. This makes interoperability between organizations on adjacent sub-bands easier and more economical. Mobile Data Capability - Operates in either voice or data modes within one radio, allowing the user to send and receive both types of information. This includes analog, VRM 100 and VRM 500 data. Portable Companion Radio - Compatible with the MTS 2000 portable radio series, sharing a number of key characteristics: similar software option, feature availability, radio programming, display output, feature operation, ergonomics and appearance. The MCS 2000 may be one of the smallest radios in its class, but it doesn't stop short with it many features. The three models of the MCS 2000 are sure to meet users' needs perfectly. Model I This mobile analog radio has many useful features that the customer is sure to benefit from. Some of these features include. 1 x 8 alphanumeric display. Model II This mobile radio has a large display and speaker as well as many buttons to fit the users needs without added complexity. Model III The third model of the MCS 2000 has a diverse range of features that are sure to provide the most flexibility for the user. 2 x 14 alphanumeric display. We will only program up to 16 channels and do not program for trunking systems. The item "Motorola MCS2000 UHF Model 2 100 Watts 403-470 HAM" is in sale since Thursday, July 27, 2017. This item is in the category "Business & Industrial\Facility Maintenance & Safety\Surveillance & Alarm Equipment\Two-Way Radios". The seller is "erac1" and is located in Parker, CO.